When writing my blog on Dragan Andjelic, I came across this photo of Anne Aylor and me standing in front of his installation at the Pavarotti Music Centre. She is wearing her white coat having just come out of her busy treatment room where she practised acupuncture during her nine-month stay in Mostar. 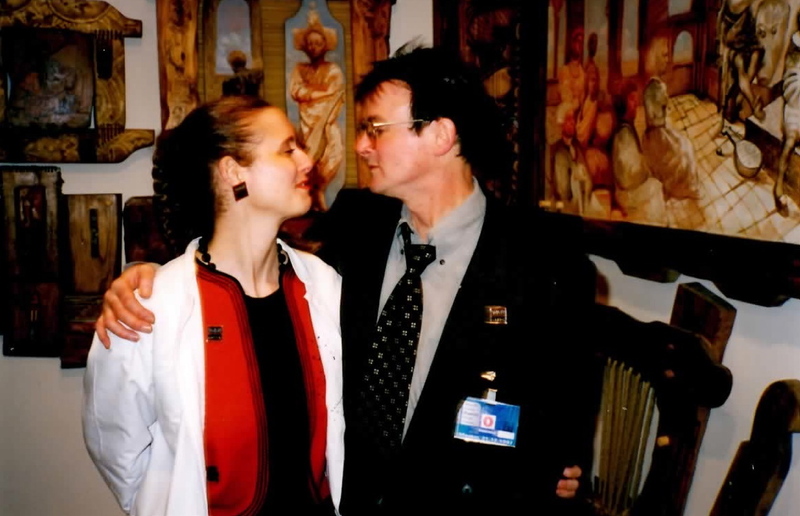 Anne had originally come to Bosnia Hercegovina at the tail-end of the war in the summer of 1994 and had written up her experiences in an article submitted to The New Republic with the title, “Behind God's Back”. On her journey there she wrote about a surreal traffic jam that had been caused by two toppled vehicles. “When the road has been cleared and we are given permission to continue our journey, we see what has caused the delay: two overturned container lorries full of pigs. The ones that are alive are being hosed down by soldiers. What is eerie is that the animals are completely silent. They are traumatised, dead or dying in the 40 degree heat. I wonder if it is the first time in history that an army has been deployed to help animals on their way to slaughter. We pass the containers and see dozens of UN vehicles facing the other way. It has been seven hours since the accident and these drivers will be here for hours more. Seeing our War Child sticker, one of them waves at me. I ask him if he speaks English so I can tell him what is causing the delay. He shakes his head, says that he is German. ‘Schwein,’ I say, the only word I can remember from my high-school German, and thumb in the direction of the overturned lorries.” A year later, War Child released the Help album with contributions from more than 20 artists including Oasis, Blur, Radiohead, Sinéad O’Connor, Paul McCartney and Portishead. It made the charity millions. The income from the album was used to provide artificial limbs for wounded children, food and clothing to orphanages, funding for school meals, support for a mobile medical clinic, the supply of premature baby units, even funding for mine clearance programmes. It was at this time that Linda McCartney heard about Anne's article and asked to read “Behind God's Back”. Perhaps that was why she decided to donate 22 tonnes of veggie burgers to War Child to be distributed in Bosnia. You can read more about Anne's work in Bosnia in Left Field.